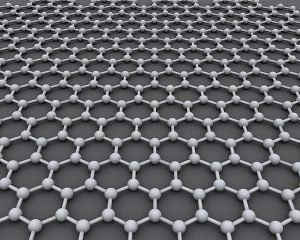 Carbon atoms form sheets to make graphene. It’s easy to make and experiment with graphene, a very cool material with lots of applications in nanotechnology. Graphene is a two-dimensional honeycomb sheet of carbon. It’s strong, flexible, transparent and an amazing conductor of electricity. Graphene may be used to make flexible monitors, and superfast computers based on tiny, energy-efficient chips. Note: Don’t accidentally short-circuit your battery! This would happen if you used a wire to connect the positive and negative terminals of the battery directly with a wire. Short-circuiting the battery damages the battery, potentially causing it to explode, which is not the goal of this exercise. The resistor is used to prevent the terminals from directly connecting. Connect the positive terminal (+) of the battery to one side of the resistor. Connect the resistor to one end of the LED light. Connect the other end of the LED to an insulated lead. Attach a lead to the negative (-) terminal of the battery… but don’t connect the other end to anything. Use the pencil to draw a thick box on the sheet of paper. The pencil ‘lead’ is graphite. Make the box a few inches long and about half an inch wide. Shade it in as dark as you can. Graphite is an excellent electrical conductor, so you just drew a sort of carbon wire onto the sheet of paper. Touch the ends of the two leads (one attached to the LED and the other attached to the negative terminal of the battery) to the ends of the graphite box. What happens? Did the LED remain dark or light up? What happens if you move the leads closer together and further apart? You can make graphene by stripping away the layers of graphite. One easy way to do this is to erase most of the graphite. You’ll still have some graphite, but also some single-layer sheets of carbon or graphene. Erase part of the box, connect the leads and see what happens. If you like, you can draw other paths with the pencil and see what happens when you connect the leads to the ends of the paths. Try short lines, long lines, zig-zag lines… whatever you like! Want more graphene? Another way to make it is to use your blender!